The idiom “small is beautiful” is often true in fiction – from short stories to microfiction, sometimes the briefest glimpses into an imagined world are the most arresting. 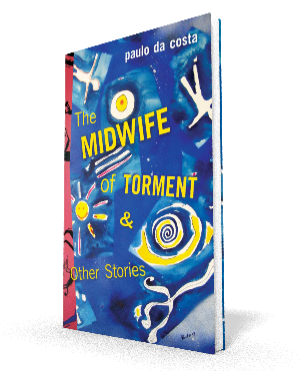 The Midwife of Torment & Other Stories (Guernica Editions) by paulo da costa is a perfect proving ground for the potential of the short and sweet – or in da costa’s case, short and beautifully bizarre, experimental, and creative. Referred to as “sudden fiction”, these sub-1000 word stories have a fable-like feeling, pushing the boundaries between traditional and speculative fiction. The pieces are complemented by a series of original black and white drawings by Portuguese artist, João Ventura. We’re pleased to welcome paulo to Open Book today to talk about sudden fiction and The Midwife of Torment. He tells us about curating a collection of stories culled from over two decades of writing, how Ventura’s pieces fit into the collection, and the importance of finding natural spots to write in. How did you organize the stories in The Midwife of Torment & Other Stories? How they interact with each other in your view? This entry was posted in Blog, Interviewed, Interviews, Interviews - M&T, News and tagged interviewed, interviews, midwife of torment. Bookmark the permalink.